Hardware manufacturer MetiaTek will release their new 5G modem in the H1 of 2019. 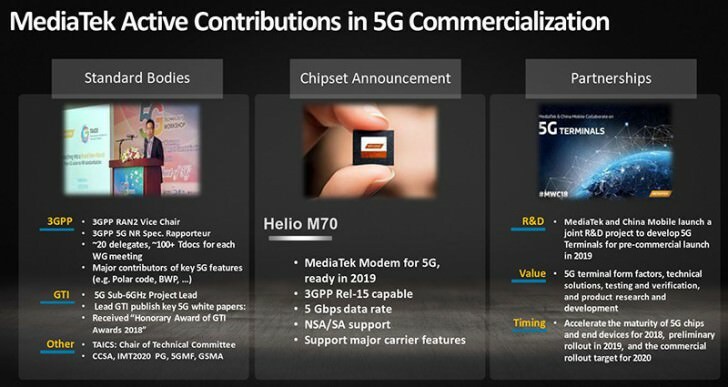 Helio M70 is a modem that comes separate from the chiset, which goes hand in hand with MediaTek's plans to supply Apple and Samsung with 5G modems. Rick Tsai, company's CEO stated that the are building and integrated 5G chipset as well, but that one will be commercially available somewhate later, in 2020. It's a known fact that it's much cheaper for manufacturers to implement integrated 5G chipsets into their devices. While some manufacturers, namely Apple and Samsung, can afford to pay the money, however other's can't. That's why the company looks to provide integrated chipsets as soon as they can. However, the company still didn't shift their R&D budget towards develiping 5G technology, since the industry in some sort of a limbo – transitional period. However, we can expect MediaTek to produce very good 5G modems when the time comes.